Well, it is my last post as a guest designer for Gauche Alchemy using their ‘Nekkid‘ kit. Wow, the month flew by. I made a tag pouch using this envelope that came in the kit. I decorated with chipboard circles that also came in the kit. Fun, huh? This kit was so loaded of goodies that I even have a bunch left over. Here is my tag. I sprayed the background and stamped. The stamped image is from one of the TH classic sets. The trims and gold wrapper were from the kit. I am so glad that you stopped by today. Thank you so much for your wonderful comments and to my new followers. Well, Saturday is almost over and I have been busy crafting. I was very inspired by Suzz Czosek’s Paper Artsy Post. She used some scrap wood to create a beautiful altered piece. First off, I apologize for the terrible photography. This late at night there is no natural light. So, I raided my hubby’s scrap pile in the garage for a piece of scrap wood. I used molding paste, a stencil, and Distress Paints to create my background. I then used Suzz’s technique for my image. I had fun experimenting and it only took me a couple of hours to make. Thank you for stopping by. Welcome to our August blog hop for Artistic Outpost. I used the Vintage Halloween stamp plate to make my wall hanging. I cut two pieces of chipboard and covered them with Webster’s Pages Halloween paper. I then used a gesso wash, a stencil and some molding paste. I used Distress Paints in the background to highlight the texture. I used some halloween ephemera in back of my stamped image. I layered a fence die cut with Stickles over my little girl. I am loving those fabric flowers. The bottom has green lace and Webster’s rose trim. The flowers have been sprayed and stickled. To see the some more inspiring projects by our awesome designers, follow the blog hop. Hello everyone! I am sharing a piece that I made for Artistic Outpost. I was inspired by the postal art challenge over at . Isn’t the color magnificient? I used Dylusions inks but I also found this awesome setting on my camera. It is called Pop Art. It takes my picture and makes the color a tiny bit brighter. I love this because when I compare my photo in normal brightness to the one in Pop Art I feel as though the Pop Art gives a better representation of the color on my piece. 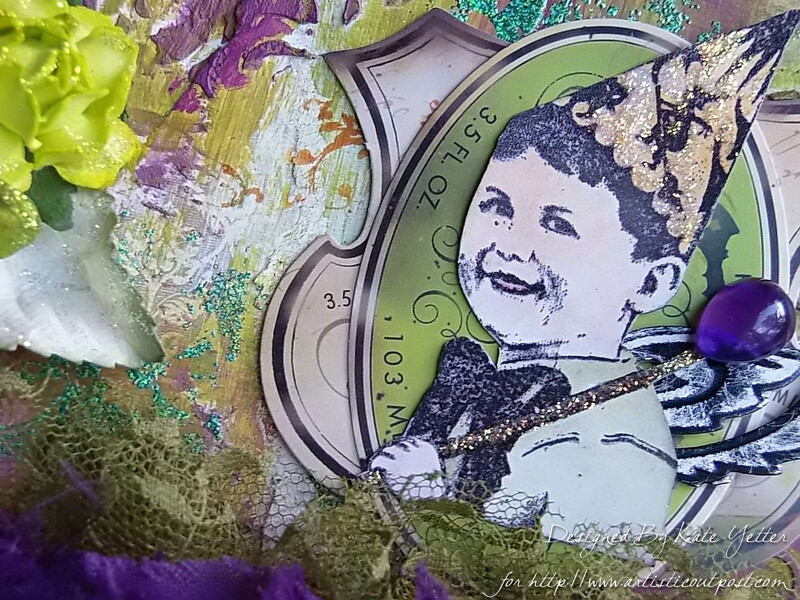 I used Artistic Outpost stamps from Paper Boy, Serenity, Ephemera Backgrounds and Paris Exposition. My inks are the new Wendy Vecchi inks by Ranger. I won all 6 of them in the recent giveaway on her FB and blog! Thank you for all your recent comments on my journal page. It is encouraging to here positive comments and thoughts on a piece that doesn’t meet my expectations.